Welp, we've got another half-clothes-buyer in the house. My Dad reminded me this summer that growing up we started buying ALL of our clothes (not just a wimpy half :) when we turned EIGHT. But Dave and I are not quite as on-the-ball as my parents and we aren't afraid to admit that. Because kids have to start paying for a bunch of their own stuff at 12 (or eight in my family growing up's case) we try to help them earn enough money so they can learn to budget, save, pay tithing to our church, and all that jazz as young as possible. Some people don't agree with paying kids to do chores (something should just be part of pulling your own load in a family) and we didn't either when our kids were young. 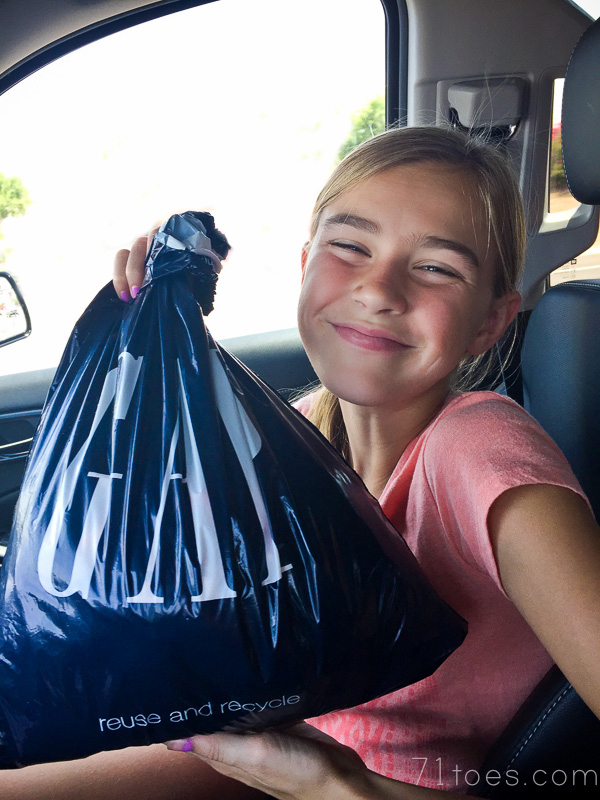 But then we realized how awesome it is to funnel the money we would be paying for clothes into their family bank account through them earning it so that they can take ownership and learn to better handle money. We've been through a whole bunch of "fails" on this. Sometimes when I write on this blog I'm sure it probably comes across that we've got everything together, easy-peasy. Like we snapped our fingers and suddenly everything fell into place. But it's taken work and re-work, and re-working again to get to where we are. And it will probably be re-worked again. Two of our kids are spenders no matter what the heck we try, they cannot seem to keep money in their bank accounts to save their souls. BUT we'd rather have them deal with that at home when we can talk through things rather than out in the real world where debt is a huge problem and finance charges and credit cards can creep in and take over. I detailed our whole money system that we have finally settled on (after 592 other tries through the years) back HERE, and we love it. Still. After over four years. Just because we love it doesn't mean it always runs like clockwork. In fact, I'm going to go ahead and say that maybe a quarter of the weeks are a bust on this little system of ours (I wonder if our system was like that growing up too? Was my Dad really the "banker" every single week of our growing up existence? As awesome as he was/is, I still venture to say I think not.) After breaks it's hard to get the ball rolling. Even a three-day weekend throws a hanger in the works. This year we're off to the races and those job charts have been overflowing with love and attention. We have re-worked our zones now that we only have three at home, we have followed through with some consequences when things don't get done (babysitting duty or just plain staying home on the weekend if you don't get them all filled out), and we are going like gangbusters around here. Things are hopping once again. But really, I digress a lot on here. What this post is about is really back in the late spring/early summer when Claire needed some new clothes. She's lucky because she gets hand-me-downs and has also fit in the same size for what seems like ages. But it was time to get a few things. Although she turned twelve in January, she hadn't really needed anything new. So as we made our way to the mall to get a little shopping in I told her I was sure glad she had earned some money through all her babysitting. It would come in handy since she had graduated to paying for half of her clothes. Her face dropped a little. Clearly, paying for any part of clothes was not what she had expected to do with that hard-earned cash that Saturday morning. But I was in awe once again, as I have been with each of my three older children, how our shopping changed that day. Claire at first showed me a whole slew of "cute" things. And it was magical how she weeded them out herself, asking about prices, excitement abounding when she realized something was on sale, etc. She made some good choices that day, and was pretty pleased as punch with herself for handing over her cash to buy some things. Dave and I (along with our kids) are on a continual learning curve trying to figure out how to facilitate it in better ways. There are all kinds of twists and turns in this parenting gig. And we sure fail at a whole slew of things. Sure, this girl (and all our kids) will/do mess up with their spending. And we'll forget "pay day" now and again. And it won't work like clockwork. But right there on that little shopping trip I realized that it really is worth all the work and hoopla on this continual learning curve of trying to help kids manage money, figure out their 10-20-70 amounts, how to earn, how to give, and yes, how to spend wisely. Even with all the fails and heartache, those golden moments make it all worthwhile! Question, if their chart isn't filled up, do they get $0? Or do you have a set amount they need no matter what? I'm glad you wrote about this for when we implement this rule. I just have to give you a huge THANK YOU for sharing your money/chart system. We've been using it with our kids for the last couple years and I love it. My boys (ages 5 & 9) have already learned so much from it. Thank you for sharing (and doing all the experimenting and testing) -- it's truly blessing our lives. I desired to come back and get a refresher on how you managed this for a while, so thank you! You guys are incredible, and have really influenced how I've raised my kids. Thank you!! How do you handle hand-me-downs? If an older kid pays for an item with his/her own money, do they have to hand it down for free or is there compensation of some sort? Such a great system. I really wish I'd known about it when my kids were younger. Great question. We haven't really done the hand-me-down thing from sister to sister since our girls were little (they are all just such different sizes it just doesn't work any more). The hand-me-downs Claire has are from a couple nice friends who were clearing out closets. But we totally bought each other's hand-me-downs at a bargain rate in our family growing up and I think it worked pretty well. It was a little different because we paid for all of our clothes, not just half. If we did more hand-me-downs around here I think the kid handing down would probably just give the one "buying" the clothes a pretty amazing deal and both could be satisfied. I have been down the rabbit hole of your financial system (seriously, I've read almost every link back in every link back you post). I was able to find answers to most my questions, but I do have one thing I never could find. What age would you recommend starting? I noticed you often say this won't work for really young kids, mine are 6, 4, and 2 -- I want to start a modified version of this with my 6-year-old, do you think I should include the 4 as well? And do you have suggestions for modification (I was thinking just two items, like the reading and the ready on time)? Thanks for taking the time to document this throughout the years. I really have loved going back and reading your info! I think trying to do this system was frustrating with little kids because we were trying to do the whole shebang and hadn't worked out any kinks in the system yet. If you've watched my Dad's video about how the whole system works when he first introduced it to us, you'll realize why it was a little complicated to try out with our little kids! :) By the time that system was implemented into our family we had enough "big kids" that they could show the way and the system would kind of fall into place for the younger ones as they followed their older siblings. But if your oldest is six, I would definitely do some sort of modified version where they are still earning money and learning to save and give, but keep the system itself super simple. Kids love to check off charts so your idea of two things, maybe three for your six-year-old would work great! I'd definitely include the four-year-old and maybe have your older child help "tutor" the younger one so he/she feels like a "big kid" and is more motivated to work. I have found over the years that pictures do wonders and make kids so excited. Maybe a picture of the morning things to get ready on time, teeth brushed, hair combed, etc. and maybe stickers or something to check off to make it more exciting? Thank you for posting about this. I have also been going back and reading previous posts as we are getting ready to implement the chore system. My kids are ages 11, 9, 7, 5. I am just struggling with the money part and cannot decide what works for us. Every family is just so different, I'm sure you'll figure out what works best for you. Maybe even introduce whatever you decide to do as a "trial period" so you can see what works and work out the kinks as you go? Thanks for sharing these details. We have been trying a few different things, haven't quite come to something that we're completely happy with yet. Hopefully we'll get there before all the kids are grown! Currently they are 16, 12, 10, 8, 5 and 3. Just keep re-working and you'll figure out something great that works for you. It just takes a lot of patience and trial and error to figure out what is best for each family as a whole. Good luck! We currently buy all our kids' clothes (9, 7, 4, & 5 months) but we do use a version of your money system. My question is if they purchase all or part of their clothing, how much say do they have in what they pick out? That's a great question. I feel like we give them a lot of leeway...it's their money. But I think with the pay half dealio I get some say as well. If they really want something I don't like I just tell them that's totally fine if they want to pay for it themselves.